In the early 1970’s a seeming hysteria had settled over the darkened swamp lands of the Louisiana, Arkansas, and remote East Texas wilderness. A series of sightings occurred that had local residents up in arms over reports of strange humanoid bipeds that appeared to be anciently related to man’s distant past. While a few movies had been released in theaters across the US to capitalize on the public fascination over reported events, still these sightings persisted for a number of years. Law enforcement switchboards were often peppered with weird disturbance calls some even coinciding with reported UFOs. Louisiana - Some young girls were having a slumber party in a family’s house trailer. They had been dressed in their pajamas and were eating while watching TV. The carefree evening came to a swift and traumatic end when one of the girls peered outside through a window gazing into another gloomy night in the Cajun country wilderness. What she saw next elicited a shrill scream! The trailer home shook from an unearthly scream followed by the sounds of heavy blows being delivered against the exterior walls. The entire home began to rock and rumble under the assaults of the terrifying entity that had stunned the family and their guests! Sheriff’s deputies called out to the scene found large foot prints outside the trailer home all around its perimeter. The incident caused some of the young girls to go into hysterics. Deputies interviewed the one witness who had seen the figure who had been lurking outside when the attack occurred. Yet, this was not to be the only incident that would be visited upon the area in the months to come. On the campus of LSU circa 1972, two male students (buddies) had informed their immediate circle of friends that come winter break they would be making a camping trip to Fouke. Arkansas, the seeming epicenter of mysterious activity, to find out once and for all just what the enigma of the Big Foot sightings taking place in the vicinity were all about. They seemed more than curious even though somewhat skeptical of the current wave of incidents that had terrorized some locals. The following semester neither person showed up to register, which many thought was odd. Yet, in college it was not unusual for burned out students with heavy class room hours to take some time off or to find a job to earn money for tuition. However, these two were expected back and had expressed their intentions to return. Had foul play been involved? The two long-haired partying pals were never seen again. In the immediate vicinity of this frequent playground of the unexplained are Camp Beauregard and Camp White, both former World War II training centers for US Army recruits prior to entering the Pacific theater. These remote locations served as convenient lover’s lanes and partying grounds for teenagers looking for fun on weekends. Kids were often times "up to no good" as can be expected, but to be the objects of more than just a routine traffic stop by local sheriffs or police could be considered scary when it involved something or someone else. Reports of teenagers being scared out of their wits by monsters or aerial lights in the night sky descending upon their vehicles began to become common place. By the mid 1970’s, such incidents had become legendary yet unexplained. Neither drugs, underage drinking or hoaxes could explain what could send terrified teens speeding down the darkened, winding, two lane, black topped roads after such freakish encounters! According to the late John A. Keel, venerable journalist and researcher UFO’s, hauntings, Sasquatch, paranormal, and seeming inter-dimensional entities all seemed to emanate from one central source. His own experiences had led him on a chase with the Yeti up in the Himalayan Mountains of Tibet. A UFO sighting over the Egyptian pyramids in 1953 while he was on assignment changed his life forever and consequently his direction in journalism as well. Much as the Indians, native to North America, think of Big Foot as not only physical, but spiritual beings capable of shape shifting, perhaps this corroborates Keel’s assessment. This next reported encounter seems to have little to do with anything spiritual as a young child whose suspicions had been aroused by the disturbance among livestock in a family barn early in the morning. The chilly Oklahoma sunrise did not go as expected when the little girl reached through the darkened barn entrance to flip the light switch so she could see what all the ruckus was about. Instead of her fingers touching the familiar wood grain of the door trim as she felt for the light switch, there was something else, a furry hide of some kind. Thinking it was the body of one of the farm animals, she was stunned to discover something entirely different. Finally turning on the light what she saw sent her into a mesmerizing panic as she stared into the glowing red eyes of a tall figure covered in dense hair from head to toe. Never having seen anything like this animal before, and living on a rural farm in frequent contact with domesti,c as well as wild animals, the child screamed after a few tense moments and bolted for the family household just a short distance away. Her tearful testimony was given to a local sheriff’s deputy once the father had grabbed a rifle and run out to the barn to see what had happened. Once again large foot prints had been embedded in the soft ground near the barn entrance. Had a bear gotten into the barn walking around on two feet? 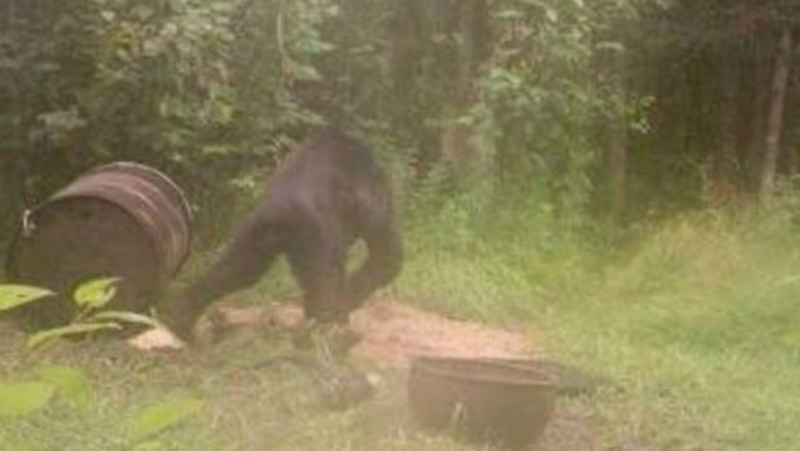 Or was it just some yahoo in an ape suit in the early hours of the morning out to scare some country child? That is unlikely. This particular incident took place in 1975, in the midst of a UFO flap that was going on in Minnesota. Strategic Air Command bases were being breached by strange aerial lights, setting off security alerts! Helicopter news teams showed film footage of circular depressions left in deep snow, only the kind that would result from the heat of the warm hull of an aircraft landing on the cold surface. The question was who or what was using the frigid Minnesota wilderness as a landing zone? In New Mexico, in numerous locations during this same time frame cattle mutilations were being investigated by the FBI and State Police. For all of these occurrences to be happening at once would perhaps tend tocorroborate the theory set forth by John Keel that the 2 phenomena were somehow interrelated. From an anthropological standpoint, it would seem that the explanation was more concrete and associated with the cryptozoological aspect. Doctor Grover Krantz believed that in the endless expanse of the Pacific Northwest there was enough of a habitat for some 1200 to 1300 of the Sasquatch species to exist. According to Lloyd Pye, another theorist on alternative history, Big Foot was merely the remnant left of surviving Neanderthal, highly elusive and being nocturnal. He was of the persuasion that one would never be caught as they have superior hearing and night vision and most encounters were extremely random and accidental. Doctor Grover Krantz believed that bagging a specimen with a rifle unfortunately would be the only way modern day science would ever conduct serious study to this enduring mystery. In all this speculation, based upon experiences with other regions of the US and the rest of the world, it seems that something very dark, foreboding, and menacingly different is afoot in the Louisiana and Fouke regions as there seems to be more of a threat coming from a potentially dangerous entity that walks the Earth in an already superstitious setting where voodoo, witchcraft, and old Acadian "wives tales" abound. In the questionable background of dense thicket, misty swamps, and shadowy lowlands where cattle sometimes sink into quicksand or hogs are killed and carried over barbed wire fences in the depth of the night undoubtedly this species is neither benign nor timid. However, whatever it is this creature is stealthy and intelligent enough to remain on the periphery of man’s knowledge and yet too threatening to simply dismiss as a product of over active imaginations and myths.